It was with a great deal of foresight that Newton Heath decided many years ago to initiate a competition called the ABC (Anything But a Collie) and what a good idea that was and how successful it has been! 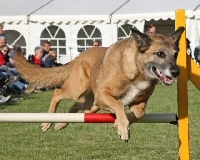 It has certainly been instrumental in encouraging Large dog handlers to come into the sport with other breeds. 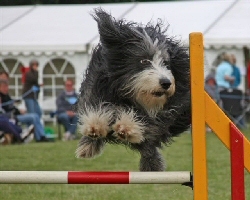 While there is no doubt that the top end of the Large grade in agility is dominated by collies, this competition gives the ABC handlers an avenue to qualify for the KC ABC Finals at the Olympia Christmas Horse Show. Dave Ray reports. 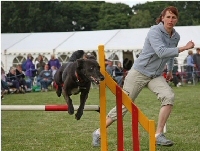 The ABC semi-final was held on the Saturday of the Newton Heath agility weekend. It is a great show, very popular, and in a lovely setting. And, we got away without any heavy rain although it was a bit breezy at times. 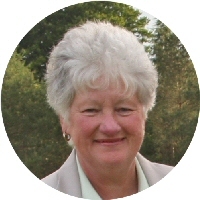 The 2008 judge was that well known character Pauline Baltes and it was a very fitting appointment for her as it was Pauline who was one of the persons who initiated this competition at Newton Heath all those years ago. 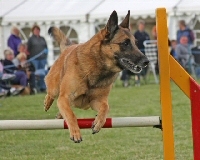 Pauline set a fairly open course which was very suitable for the type and variety of breeds that had qualified for the semi-finals. I suppose it was still a bit unsettling though when the first two handlers got eliminated. 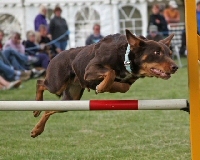 Running in 4th place Nigel Staines with his young Kelpie picked himself 10 faults up, Nigel was the defending champion of course but this year had decided not to compete in the ABC with his Agility Champion Kelpie as he was going to save himself for the Large Dog Olympia semi-final at the Royal Show. Raymond Workman and Jean Tuck put in the first clear rounds running 6th & 7th but unfortunately would find themselves not fast enough to finish in the top ten and the same could be said for Jane Guyan running 14th with her super Boxer and Sally Rhoda with her lovely Lurcher running 15th. A few more clears followed and running 24th Natalie Silcock with her BSD X took the lead with a clear in 33.83 which was quickly taken off her by Louise Challis with her Gron with a clear of 33.62. David Leach with his very handsome Malinois, Rusty, snatched the lead off them in 30.42 but they would only stay in the lead for two dogs as running 52nd Mark Douglas and his Kelpie Ag. Ch. Cories Ruby Tuesday put in a stunning clear round in the only sub-30 second clear run of the semi at 29.91 seconds to a tremendous round of applause from the large knowledgeable audience watching. 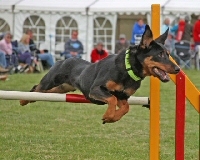 Interestingly the only other sub-30 second run in the semi was a Kelpie with 10 faults who got round in 29.55 and guess who the handler was? Yes, it was Mark Douglas. Does this show he is fitter than everyone else? 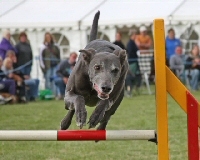 No one would be able to catch this time but the very popular Ray Ellerton running at 55th ran his heart out with his stunning Lurcher Little Man Maximillan and got a clear in 31.32 which would see him finish in 3rd place. 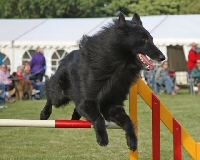 The last two clears were run by Sherie Vickery-Carter and her Kelpie and the well known Andy Brown with his Groenendael and with times respectively 32.58 and 32.14 we will be seeing both of them compete in the final at Olympia.